During my recent trip to Japan, I had every intention of splurging on a special Wagyu steak dinner. 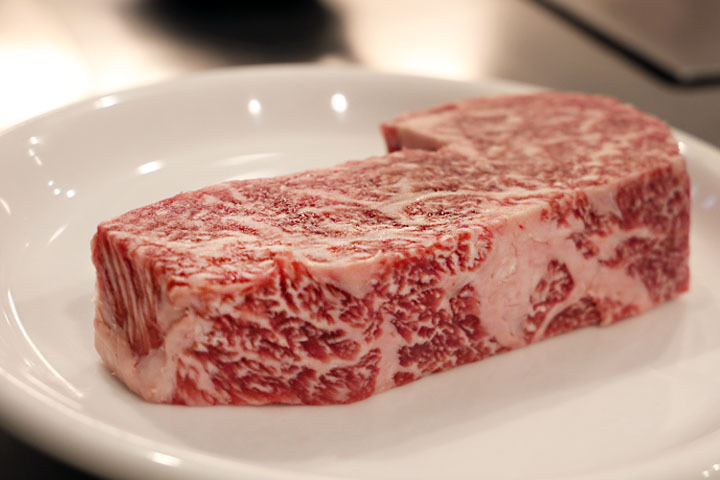 Wagyu is the generic term given for Japanese breeds of cattle, however the meat is well regarded for its tenderness, superior fat marbling and buttery taste, which is the result of strict guidelines for rearing and feeding the cattle. 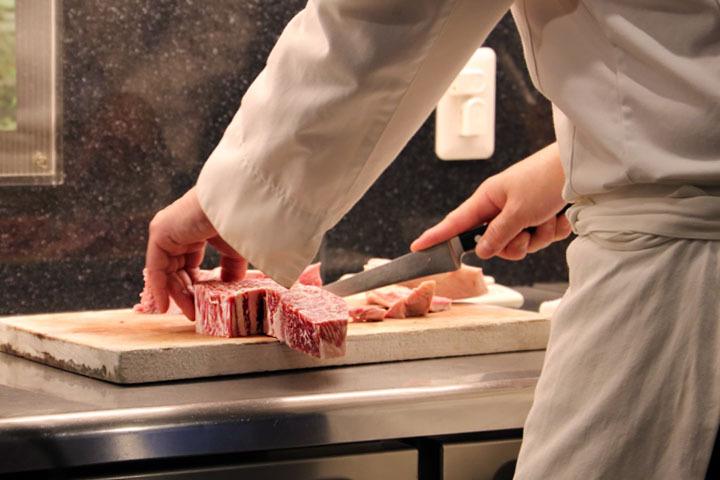 There is no one single region of Japan that produces premier Wagyu however as I was visiting Hokkaido, the unofficial foodie capital of Japan, I planned to have my special steak experience here. After a lot of research, I made a reservation at 牛の松坂 Ushino Matsuzaka Steakhouse and I ordered the Furano beef set menu in advance. 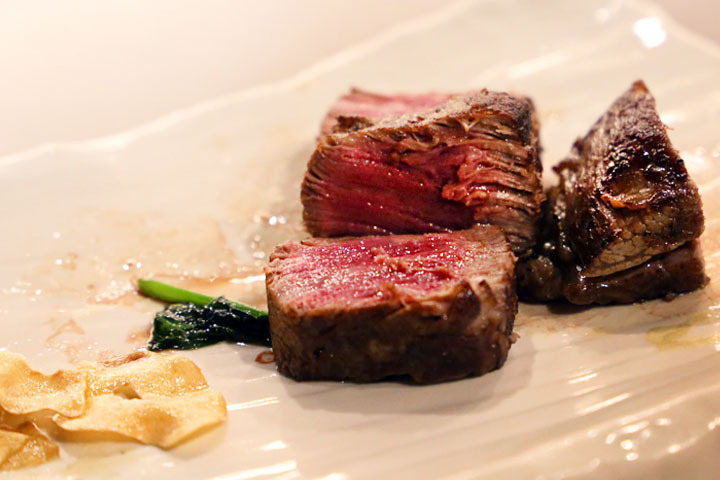 Furano is the original steak of Hokkaido. The cattle are reared with meticulous care in the Furano Basin, which lies at the foot of Mount Tokachi in the Daisetsuzan National Park at Hokkaido’s center. Their diet consists of wheat, hay, rice straw, wheat straw, beet pulp, tofu dregs and beer, which ensures the cattle are healthy and plump. The tofu dregs, otherwise known as okara, are unique to the Furano cattle diet and contribute to meats unique flavour. 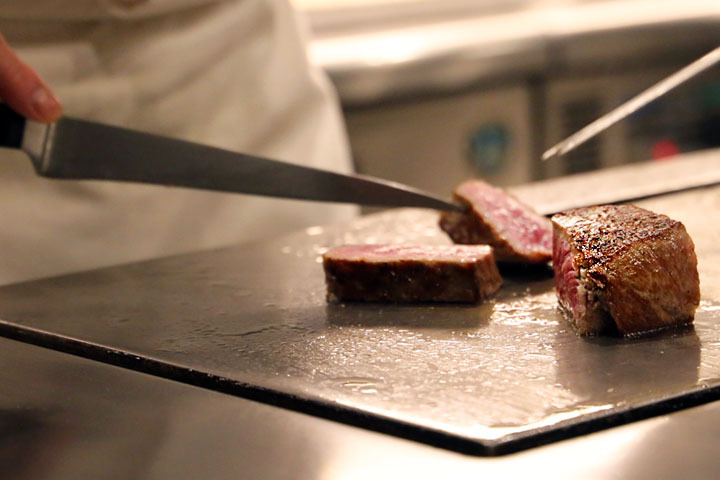 牛の松坂 Steakhouse is hidden within a nondescript, dark and narrow building in the heart of Susukino. This is the red-light district of Sapporo but it is also known as a centre of great eating and drinking holes. After climbing three sets of stairs to the restaurant, we were welcomed warmly by Chef Watanabe-san as we took a seat at the grill. 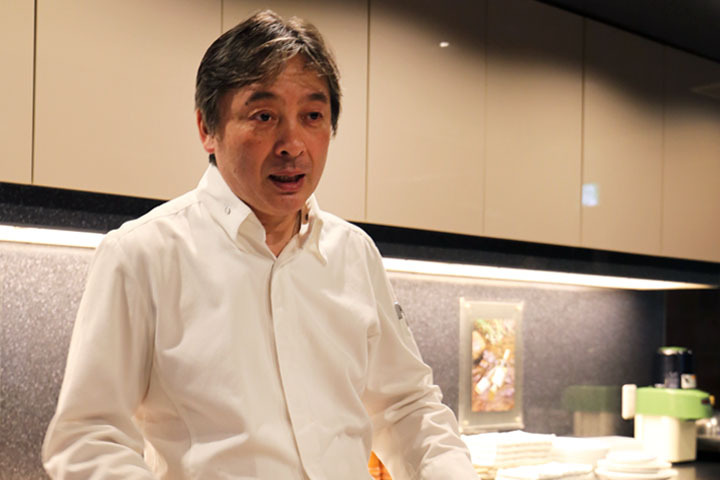 Chef Watanabe is a Sapporo native, passionate foodie and avid conversationalist. He does not speak English but my Japanese companion was able to act as a translator during our meal. 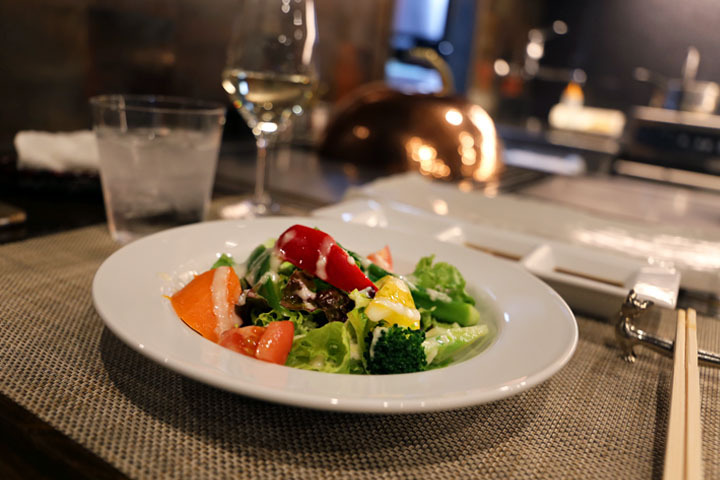 We ordered a bottle of bottle of Chablis for ¥4,500 and were served cold appetisers of thinly sliced roasted beef and garden salad to begin our set menu. Chef Watanabe meanwhile heated up the grill in preparation for the main course. As 牛の松坂 is a Teppanyaki-style restaurant, we would be enjoying the spectacle of having our meal cooked on the hot iron griddle in front of us. Chef Watanabe proceeded to explain more about the meat we would be eating. 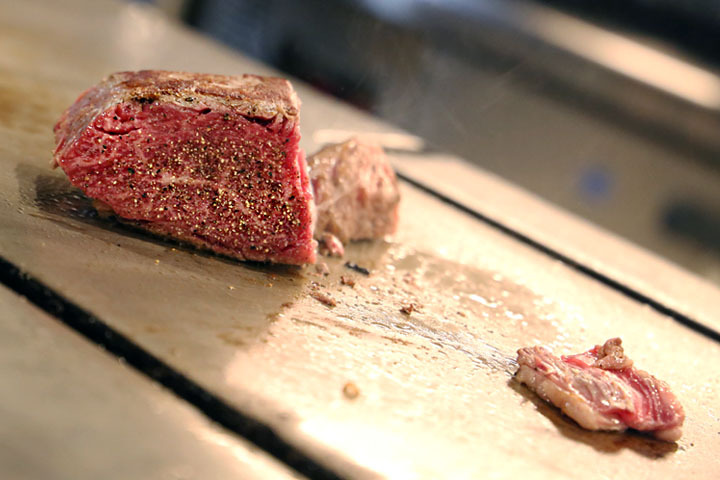 Wagyu meat is graded from one through to five in Japan and we would be served A5 Furano, which is the highest grade. This is the same Wagyu that was served to leaders and executives during the 34th G8 Summit held in Hokkaido in 2008. 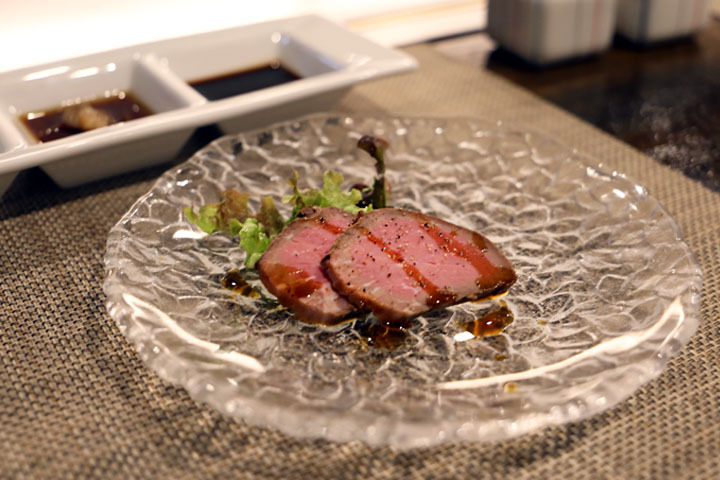 Chef Watanabe took a large hunk of raw Furano Wagyu from the fridge and expertly cut a generous sirloin steak. He pointed out the special characteristics of bright red colouring and detailed, fatty marbling. 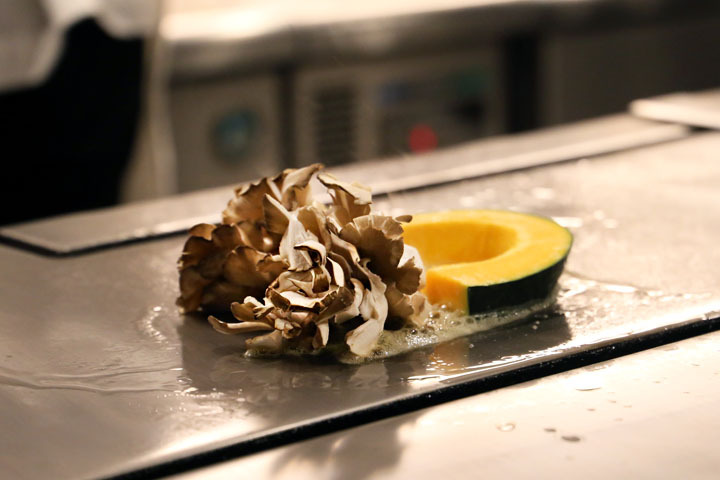 With the grill now piping hot, he melted a large wedge of butter and started sizzling some maitake mushrooms and pumpkin. As he gently placed the sirloin steak on the hot plate, it made a lovely soft hiss. The smell of butter and searing steak filled our nostrils and whetted our appetite as we looked on with a glass of wine in hand. We had asked for the beef to be cooked medium-rare but as the sirloin was so thickly cut, it took fifteen minutes to grill to perfection. The meat was soft and tender, fatty and buttery. A concentration of unami and sweet-tasting juices filled my mouth as I chewed each bite. Furano is famed for its condensed, rich flavours that slowly melt in your mouth. We didn’t need to add any further condiments to our steak, although we were presented with small dishes of ponzu sauce, wasabi and salt. After devouring our steak Chef Watanabe asked if we would like another serving of beef, which would be an additional cost to the set menu we ordered. We had still not sated our steak-cravings so we ordered a smaller cut of the Furano fillet steak. Whilst not as fatty as the sirloin, the meat was still well-marbled with scribbles of fatty, white lines contrasted marked against the blood-red beef. Chef Watanabe seared the outside of the fillet for ten minutes before slicing it into medium-sized chunks for us to eat. We finished our meal according to Japanese custom with a bowl of garlic fried rice. Carbohydrates are always consumed last during a Japanese meal, which strikes me as a rather intelligent choice. You don’t want to fill up on the cheap stuff first. My first Wagyu steak experience at 牛の松坂 Ushino Matsuzaka Steakhouse was a memorable one. I savoured the unique, fatty qualities of the Furano Wagyu steak. The meat was buttery and sweet-tasting, although it lacked the earthy flavours of Scottish grass-fed steak, which I am more used to. Chef Watanabe’s performance was also outstanding. Watching him cook our meal and discussing the ingredients and regional cooking methods together greatly enhanced our dining experienced.